3 Years legal expense cover FREE! 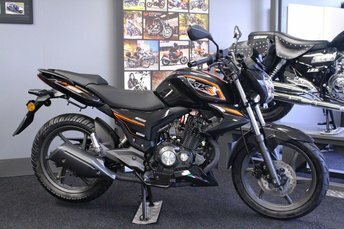 Part Exchange VERY Welcome, 2 YEARS WARRANTY - The Fabulous RKS125 Is A Cut Above Other 125cc Bikes! The Quality Finish, The Stylish Lines & The Punchy Engine Make This Bike Stand Out! Easily As Good As Any Of The Other Machines That Are Twice The Price - So It Simply Cant Be Matched For Value & Quality! These Great Bikes Are Available In Black, Red Or White. This is a brand new bike with 2 years manufacturers warranty. We are an authorised Keeway dealer stocking new bikes. (See our other Keeway models) -Price excludes DVLA, RFL & Manufacturers Delivery. OTR Price is £1899 Typical finance example, £199 DEPOSIT 24 X £78.00 APR 9.9 % Total amount payable £2072 Finance available STS, Terms & Conditions Apply, All Finance Is For Over 18's Only. Get the best deal on a used Keeway Rks bike for sale in Northampton by making your way to Cooperb Motorcycles Ltd today. You will find every available model listed here on the website, and as all our stock is competitively priced you should have no problem sourcing a pre-owned Keeway to suit your budget. Take the opportunity to browse our current range online before contacting a member of the showroom team to find out more. Our friendly and knowledgeable staff will be more than happy to answer any questions and provide advice and guidance when necessary. Alternatively, why not pay a visit to our showroom in person and take a closer look at the selection of used Keeway Rks bike models for sale.